Western diplomats have characterized Iranian Foreign Minister Javad Zarif's presentation this morning at the opening session of the Geneva Talks as "very useful." 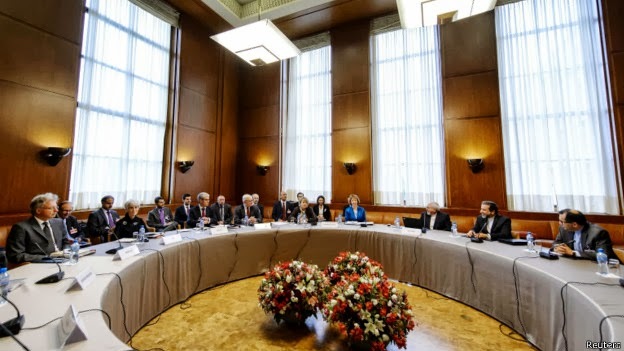 The Geneva Talks between Iran the six major powers have started in Geneva. The diplomats from Iran, U.S., Russia, China, U.K., France and Germany will meet for two days at the Palais des Nations. Iranian President Hassan Rouhani’s overtures and those of his foreign policy team have raised hopes and expectations of progress in negotiations. - Iranian Foreign Minister Javad Zarif started the meeting today by giving a power point presentation with the Iranian proposals to P5+1 delegates. - “The atmosphere has been different with the new (Iran) team ... there was a positive attitude from both side,” EU Spokesman Michael Mann told reporters at the conference. - In a change of procedure, both sides chose to speak English at the meeting. - Zarif arrived in Geneva accompanied by his doctor. He is still struggling with pain that landed him in hospital last week after suffering an anxiety attack. Iranians are liars. That's the essence of iranian culture. Therefore I very seriously doubt the West had a good traction. Why don't you rush to join your fellow RATS in Syria and fight for 'democracy'-! ?- seems you don't know the meaning of a LIAR! -The cruel liar is that one who has bombarded our ears on a daily basis that ASSAD will fall in a weak! ,will fall in a fortnight!! ,some claimed hours!. BUT the exceptional one is that who claims IRAN will assemble a nuclear bomb in a weak! !sometimes he forgets and gives a six month time frame ,but He goes on to always forgets what he said yesterday and comes with some new alarmist news -Iran has only a year"-this madness [lies] has been going on for years!. may the Almighty open your eyes and see the true liars!! Don't be silly B.M.A ! Assad has already fallen. The man in charge in Syria is the ghost of Assad. Now it is up to the Ghost Busters Team to deal with him !! Let's hope common sense and rationality will prevail in favour of the common good. B.M.A, Anon 7:43 AM knows exactly the meaning of liars. That's what hasbara shills are. I'll join you in that hope. You'll all see. It will be revealed that Iranians lied about the proceedings, and that indeed the West was shocked by the ridiculous nature of the proposal. The problem is that Iranians are mainly lying to themselves at this point. "You'll all see"! Lol, yeah. The hasbara are getting desperate now. What can be seen clearly is the lies of hasbara shills. no, that will not be revealed. the Iranian proposal is being taken seriously. there is atpresent not even a preliminary deal, but as the Iranian proposal included an acceptance by Iran of the Additional Protocols for iran under the NPT, it's worthy of consideration.